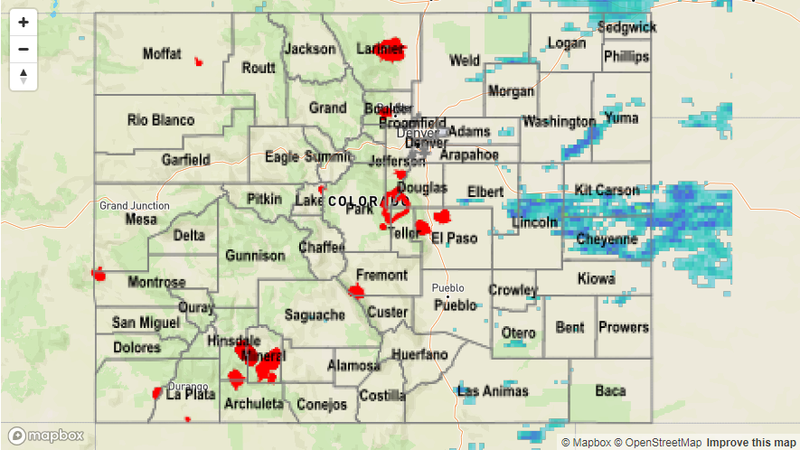 Strong westerly flow aloft limited the amount of moisture available for thunderstorms in the High Country, Northeast Plains and Southeast Plains. 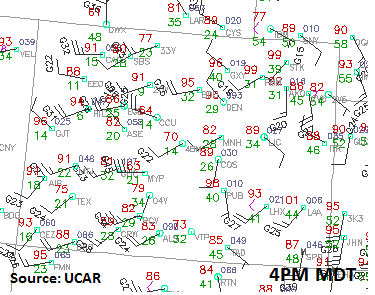 Below, the low dew point temperatures show the lack of moisture at 4 pm MDT yesterday. West of the Continental Divide, the dew points were in the teens. Downward mixing of the strong upper level winds created gusty conditions on the Western Slope. A wind gust of 51mph was reported in Mack, CO at 1:30PM MDT. A north/south dry line formed east of the Continental Divide in the afternoon limiting moisture to the Northeast/Southeast Plains. Denver recorded a 43F dew point early in the morning, and it had dropped to 29F by the afternoon. The drop in moisture from the previous days along the CO/KS border caused thunderstorms to produce gusty outflows and little rain. Outside Burlington, a 59mph gust outflow from a thunderstorm was reported at 9pm. Rainfall estimates (below) were around 0.25 inches to 0.60 inches with most storms and up to 1.75 inches under the small storm cores. CoCoRaHS data has the highest recorded rainfall amount in the northeast corner of Cheyenne County at 0.39 inches. This is in an area were rainfall estimates are in the range of 0.50 and 0.90 inches, so the radar rainfall estimates may be too high due to both dry sub-cloud air and hail contamination. No flooding occurred yesterday. Please see the STP map below for a look at 24-hour precipitation totals.